In a faraway world, an event of cosmic importance is about to occur: a Great Conjunction of the planet's three suns. A thousand years ago, when the suns last came together, a cruel and selfish tribe known as the Skeksis seized control of the radiant Crystal that once brought harmony to all beings. A quarrel erupted and blows were struck, fracturing the Crystal and sending a shard flying off into the countryside. The Crystal darkened and evil spread like a cloud across the land. Now, as Jen, last known survivor of the Gelfling race, it is up to you to travel the world and fulfill an ancient prophecy by restoring the missing shard of the Dark Crystal. The power to end the Skeksis' reign is yours. But there is much to be learned and time is short. Unless you heal the Dark Crystal before the Great Conjunction, all things whole and good will be destroyed, and the tyranny of the Skeksis will be reconfirmed forever! Hi-Res Adventure #6: The Dark Crystal is Sierra's first game adaptation of a movie, based on Jim Henson's epic fantasy film that premiered in theaters in December 1982. Designed by Roberta Williams, the game was released in the Spring of 1983 and was the first title of the new SierraVenture brand, with previous titles of the Hi-Res series, first released under Sierra's previous name - On-Line Systems - being rereleased shortly later. 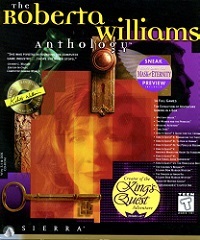 The Dark Crystal would also be the last Hi-Res Adventure as Sierra would design the first animated adventure game - King's Quest - along with the new AGI engine, later in 1983. A spin-off of The Dark Crystal, titled Gelfling Adventure, was designed by Al Lowe and released in 1984. 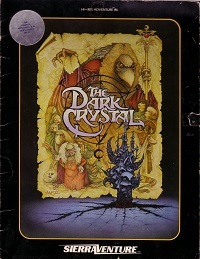 Although using the same graphics, it replaced the Dark Crystal's text parser with the option selection system first used in Dragon's Keep, made the story more linear and changed some puzzles, making the game more suitable for younger players.